Version 1.20 is already available for purchase here. This version includes several improvements and some fixes. The most relevant new feature is the TCAS system. It has been modeled to resemble the modern TCAS II v7, with TA/RA visual and aural advisories, integrated in the VSI and Weather radar instruments. It is compatible with any third party addon using X-Plane’s multiplayer interface to position traffic and it has been tested in IVAO and VATSIM. – All custom commands are now operative for hardware controller allocation. – TCAS implementation in VSI and Weather Radar (TA and RA modes). – Weather Radar range and other fuctions are now operative. – Barometric pressure manipulator correction. – Engine’s displays now with rolling numbers and blinking advisories. – Slow fast indicator is now shown with AT dissengaged. – Aerosoft airac database naming convention now supported. – X Plane GNS430 airac database naming convention now supported. – Tuned up fuel burn rates. Still work to do with APU. – Tuned up AP modes. SPD/MACH SEL now selects V-SPD pitch mode when out of IAS/MACH mode. – Tuned up AP modes. SPD/MACH SEL is now not selectable while in TO, GA or TO-FLX modes. – Other improvements in AP modes. – Tuned up exterior lights. – Added camera movement restriction to the inside view. 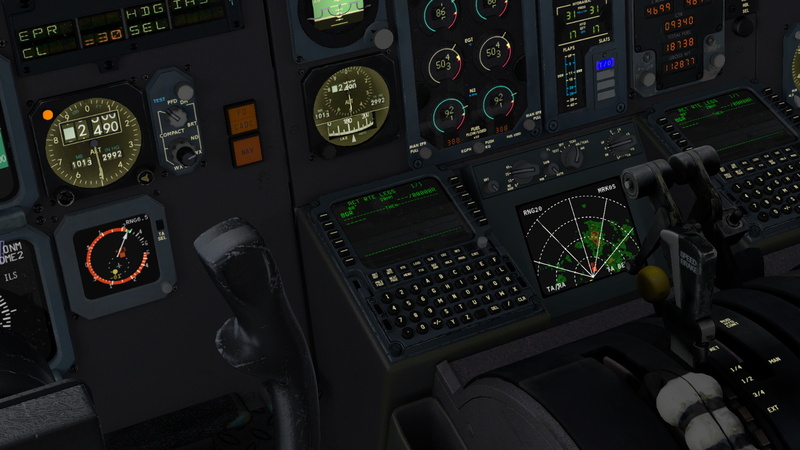 – Added details in cockpit textures, specially in aft pedestal. – Corrected some texture problems in the wheels. – Autobrakes are dissengaged when manual braking is detected.